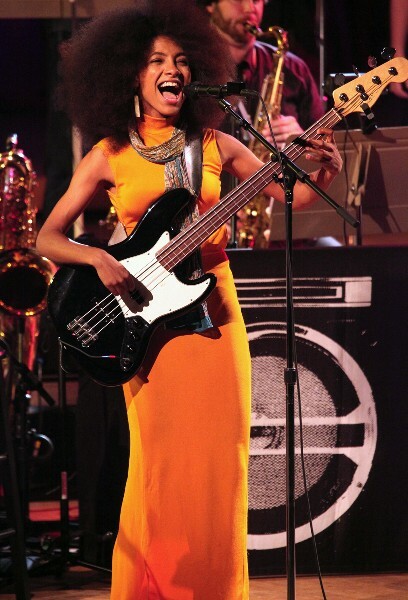 Esperanza Spalding fronting her band at Tanglewood. Hilary Scott BSO photos. The face and figure of a fashion model playing bass. The last night of a world tour. 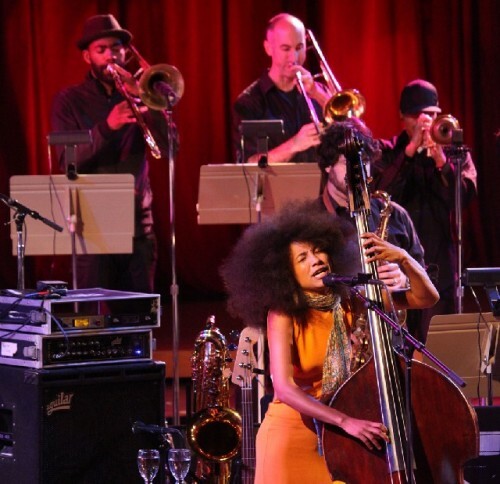 Ozawa Hall was filled to the rafters with more spreading their blankets on the lawn for a sold out performance by the 2011 Grammy winner for Best New Artist, the prodigy and phenom, Esperanza Spalding (born 1984). Inspired by seeing Yo Yo Ma on Mister Rogers Neighborhood at four, within a year, she taught herself to play violin. She joined the community based Chamber Music Society of Oregon staying for ten years eventually as concert master. She later switched to bass and after graduation from Boston’s renowned Berklee College of Music at 20 became its youngest faculty member. 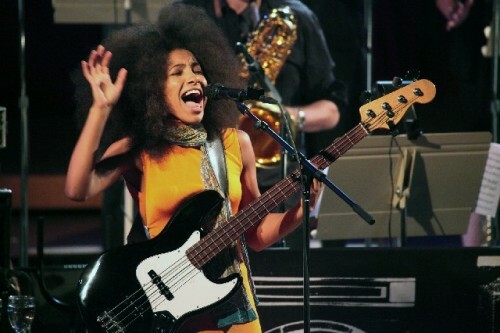 On Saturday night she performed at the Newport Jazz Festival. The Sunday appearance with her band marked the final gig of the Radio Music Society world tour in support of her second Grammy winning album. Under an enormous mass of hair, a fro back to the 1960s, poured into a backless, orange sheath dress accented by a scarf, Spalding, with fashion model looks and figure, slithered onto the stage. Easy on the eyes and ears she’s the real deal, the total package of vocal, instrumental and composing chops. She wowed the audience for two hours with a finale that featured her accompanied by pianist Leo Genovese scatting through “Chacarera” from her first Grammy winner Chamber Music Society. During a star studded jazz party the night before with icons including now 80-year-old Wayne Shorter to whom she is particularly close, and pianist Herbie Hancock who has also performed in Ozawa Hall, he spoke about being nervous when performing “Charcarera.” She stated that this time she would get it right. With a hitch. While a young artist who has won every possible accolade she does not yet have the gravitas and life experience that places her in the company of the greatest jazz singers. With her awesome looks and accessible jazz/pop style she may be more Lena Horn than Billie Holiday or Ella Fitzgerald. As a soul singer, arguably more Natalie Cole than Aretha Franklin. Augmenting her vocals while playing bass the band was an extension of her singing. It was used as an elaborate accompaniment rather than an entity unto itself. In this context her voice was conveyed as an instrument with stunning precision but rarely as a vehicle for humanistic interpretation of feelings. While impressed by her overall chops I found myself rarely moved. The greatest jazz and blues singers had the ability to sell a song and make us feel the lyrics. The between songs patter often seemed more about dating and hooking up than the ebb and flow of mature relationships. Perhaps this is just a generational response. It is likely that her approach appeals to the young audience she is luring into her music so successfully. There were brilliant moments but also conundrums. Other than that greatest of musicians, Charles Mingus, I can’t recall seeing a jazz band fronted by a bass player. Particularly while also singing vocals in a slinky dress. I know, get over it dude. The arrangements were intriguing and richly varied. The horn section of two bones and two trumpets was inventive and the three reed players performed on a wide combination of instruments. In addition to tenor, alto and baritone sax there were also parts for bass clarinet, soprano sax, and flute. It was good to see two other women in the band including the superb Tia Fuller on alto sax and Leala Cyr who alternated between trumpet and backing vocals. The solo work was exceptional particularly Alan Ferber on trombone and Corey King on trumpet. Overall it was a disciplined and fly band. Driving it was the terrific, non nonsense drummer Lyndon Rochelle. His beat was strictly business with all the right accents and no showing off. His straight up style is in the big band tradition of Jo Jones with Basie, always in the right place at the right time, and the workmanlike Sam Woodyard with the Duke. Bottom line, for me, as Duke said "It don't mean a thing if it ain't got that swing." It never got into my bones. For most of the night I was just bolt upright in my seat. Sorry Esperanza, other than now and then, it wasn’t all that much fun for me. Next time I’ll try harder. 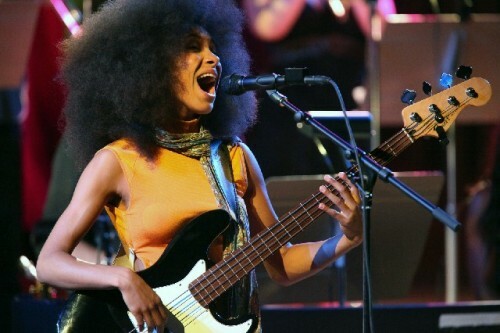 "I couldn't agree with you more about Esperanza, which is why I didn't go to the concert even though a couple of tickets came my wayâ€¦ And were withdrawn, responding to my disinterest. Although I think she is a fabulous bass player and would have been willing to fight the crowds and whatever else was necessary in order to hear her had she been playing, firmly duckâ€“taped around the mouth, I was unwilling to foot up with the likelihood of having to listen to her, another in a long line of musicians whose genius has clouded their minds and as they admired their reflection, appearing to be all-knowing in all things. Anyhow, you're possibly the only other person I know of who feels this way and for you to have the balls to go against overwhelming, popular sentiment makes you, well I guess, The Big."